Facebook Banned Google Plus ! Hi Friends Finally after an undisputed journey for more than six years, the world's largest social networking site Facebook met with a serious competitor, Google Plus. With the announcement of Google+, Facebook has been facing severe heat in the social network market. And day by day, the war between the two counterparts is becoming nasty! In a recent move to tackle the expansion of Google Plus, Facebook has reportedly banned an advertisement that asked Facebook users to follow a particular person in Google+. 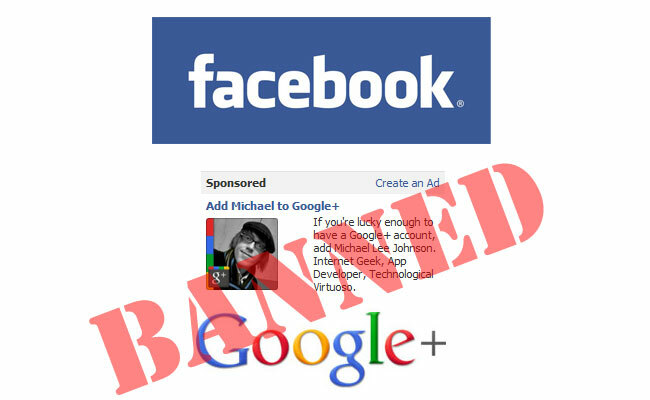 The web developer Michael Lee Johnson alleged that Facebook banned his ad on Facebook, which asked people to add him to their Circles on Google+. "I recently ran a Google+ advertisement on Facebook that got all of my campaigns suspended. – Great," Michael Lee Johnson wrote on his Google+ account. It's interesting to see the World War between Facebook and Google Plus. Though Google+ is still in field trial stage, it manged to grab more than 10 million users in two weeks. Moreover, 'How to get a Google+ Invite' is still a hot topic in Twitter and Facebook! Anyhow, it's expected that another giant is also set to dive into the social networking market. According to rumour mills report, software giant Microsoft is also working on a secret project to launch a social networking site called Tulalip. So, it seems to be a never-ending war. 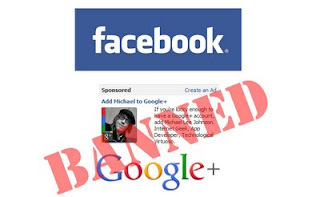 3 Respones to "Facebook Banned Google Plus !" No surprises there, facebook has seemed to become more and more protective with its "father knows best" attitude. Can Google plus beat Facebook!